According to Statistics Finland, output of total industries adjusted for working days was 0.5 per cent higher in December 2015 compared to December 2014. The original index in total industries grew by 3.7 per cent in December. In 2015, industrial output contracted by 1.1 per cent from 2014. Industrial output has decreased continuously for four years in a row. Finland’s industrial output has declined by 19 per cent from the level in 2008 prior to the financial crisis. The Finnish industry has seven years of dark times behind it. Industrial output did not plummet this much even during the Second World War and the 1938 level was exceeded as early as 1946. 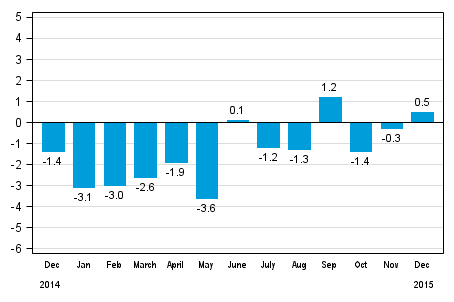 In December, seasonally adjusted output grew by 0.2 per cent from November. In November, seasonally adjusted output grew by 0.3 per cent. 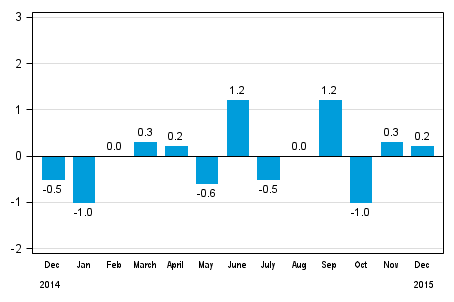 In October, seasonally adjusted output decreased by one per cent month-on-month. 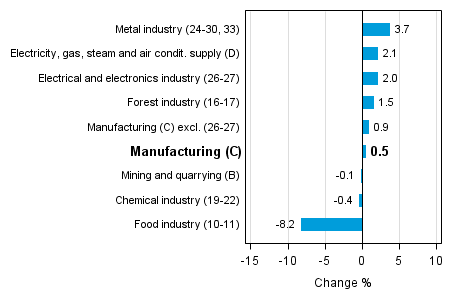 A majority of the main industries grew in December year-on-year. The largest growth of 3.7 per cent was recorded in the metal industry. In December, the electrical and electronics industry increased by two per cent. In the forest industry, output grew by 1.5 per cent. Production went down by most in the food industry, by 8.2 per cent, from one year back. In the chemical industry, output fell by 0.4 per cent in December. In December, capacity utilisation rate in manufacturing (C) was 77.8 per cent, or 0.9 percentage points higher than one year earlier. In the forest industry, capacity utilisation rate was 80.3 per cent in December, or 1.1 percentage points higher than in December 2014. In the metal industry, capacity utilisation rate was 80.2 per cent in December, which was 1.6 percentage points higher than one year earlier. Revised data for December 2015 will be published at 9 am on 10 March 2016 in connection with the release of industrial output data for January 2016. The revision is influenced by the estimation used in the latest release, which concerns the periodic tax return data used for enterprises with fewer than 50 employees. Because of the method used, seasonally adjusted figures for previous months may change even if the original figures do not become revised. The seasonally adjusted figures will also be adjusted for working days. ISSN=1798-9272. December 2015. Helsinki: Statistics Finland [referred: 23.4.2019].